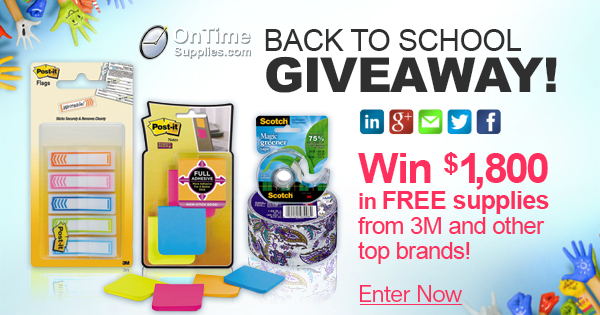 Win $300 of Scotch + Post-it products in the Back to School Giveaway! The $1,800 school supplies giveaway from On Time Supplies is well underway. Lots of you guys have joined our email list, and are liking, sharing and tweeting up a storm for a chance to win. And we’ve gotten some great stories about awesome teachers! Let’s take a closer look at some of the prizes, specifically the ones from 3M. You guys, they’ve provided so many of our favorite Scotch and Post-it products — $300 worth, in fact! You can’t even buy some of this stuff, that’s how cool the 3M package is. (15) rolls of Scotch Tape, from always handy Magic Tape to super-cute paisley duct tape. Plus a cute tape dispenser. (3) pairs of premium scissors, including a really cute pair from the 3M Designer Series that you don’t have to loan out to anybody. (8) packs Post-it Notes in various colors and sizes, as well as a sweet Pop Up Note Dispenser. (8) packs of Post-Page Flags and Tabs. You don’t have to be a teacher or a student to want to get your hands on this swag! 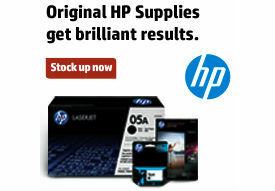 You can buy most of the 3M prizes from On Time Supplies here, where you can also get a look at many of the other prizes. Follow us and share the giveaway on Facebook, Google+, Twitter AND/OR LinkedIn. Leave a comment on this post telling us about your favorite teacher or student! Make sure you mention where you shared the Giveaway so we can count your entry. Reminder: contest entries go here. Use this post to talk about 3M, or school supplies, or anything really. Just make sure you post your contest entries on the contest post so we can get you entered in the drawing. My favorite teacher was Ms. Zurbrik. She was a very interesting and inspiring teacher. She was my inspiration throughout high school and college. My favorite teacher was Mrs. Anderson. She came in to our class half way through first grade. Our former teacher hasn’t liked me and I remember her once calling me a liar while I was talking to another teacher about a doctor’s note. When Mrs. Anderson started it was a complete 180. She treated us all kindly and made learning in her class fun. We had her again in second grade. She is probably the biggest reason I became a teacher. We are now friends on Facebook and she continues to encourage me whenever she gets the chance. my favorite teacher was my gifted teacher. she was my teacher from kindergarten through fifth grade. I really loved her class. she made me feel special. Joined mailing list, subscribed to blog, shared on Google + and retweeted. My favorite teacher was my high school English teacher Mrs. Elaine Moore, who took a group of us students to England, Spain and France.